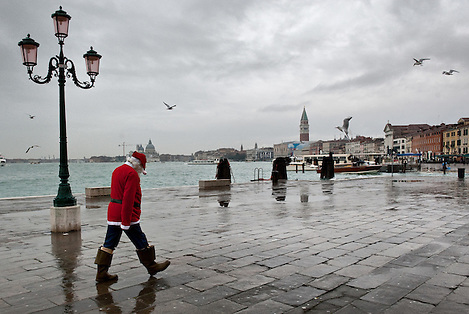 Father Christmas wearing boots to cope with seasonal high water walks along Riva degli Schiavoni in Venice. The Christmas of most of the old Italian writers as well as Dickens and even Hollywood movies is all about family, friendship, compassion and goodwill for all , it is about the “Christmas Spirit” that stands for core religious values. On the other side The Christmas that you see every day is about demanding or try to sell expensive gifts, selfishness, eat as much as you can, getting drunk. I hope you belong to the first category but whatever you choose a Merry Christmas to all my Catholic friends!